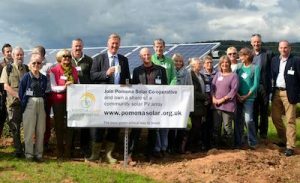 Pomona Solar Co-op has 300 kilowatts of solar PV panels up and running in Herefordshire! Find out more on 5 July 2016. The Directors would like to invite both members and non-members to come along on the evening of our 2016 AGM to take a look at the site (5.30pm), join us in Tarrington for drinks and a light buffet (6.30pm), and attend the AGM (7.15pm). You are welcome to take part in the whole evening, or just to pop along for a look or a drink and chat. Local residents are especially welcome. While it’s not essential to register for the AGM, if you wish to join us for the site visit or drinks/buffet it would help us enormously if you could please register in advance here – where you’ll also find a map and all the other details of the event. The share offer extension to raise the capital needed to build an extra 50kW is now fully subscribed. For more information email info@pomonasolar.org.uk or call Sharenergy on 01743 277119.